Nice is one of the most popular destinations on the French Riviera. Close to the Italian border, near the Mediterranean Sea, Nice attracts tourists at an international level and many actors and stars have bought luxury villas of Nice and its surroundings. 'La promenade des Anglais' along the edge of the Mediterranean Sea and is frequented by many pedestrians, cyclists and roller-skaters and is one of the famous attractions of Nice. A walk in the hills above the city of Nice offers a breathtaking view of the ‘Baie des Anges’ and pebble beaches overlooking an azure Mediterranean Sea. The city is crisscrossed by narrow streets and outdoor markets, charming restaurants, museums and souvenir shops with Provence gifts and wines, and many fashion shops. Nice flower market is also very popular and attracts many visitors each year. 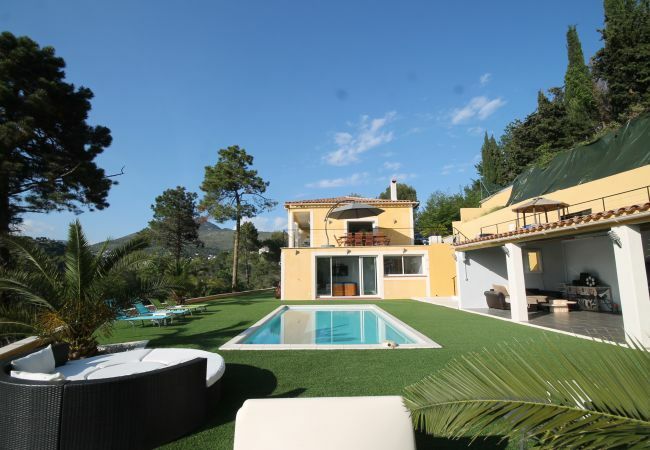 Home Sud, established estate agent in Cannes offer a selection of prestigious villas to rent in Nice, stunning villas in Grasse, holiday properties in Valbonne, and holiday rentals in Cannes. Please call our offices in Cannes for further information on how to book your holiday in the South of France, or to select the perfect family villa in Provence with a pool. We specialise in villas in Provence and self catering holiday apartments in the South of France and along the French Mediterranean coast. Please contact our English speaking team +33 4.89.68.80.30, or by email contact@homesud.fr for further information on holiday rentals in France.